This is a pic of the first school of Stripers we hit early this morning. This shot was taken at 10 mph but I had been running 25mph when I located a school right over the channel. 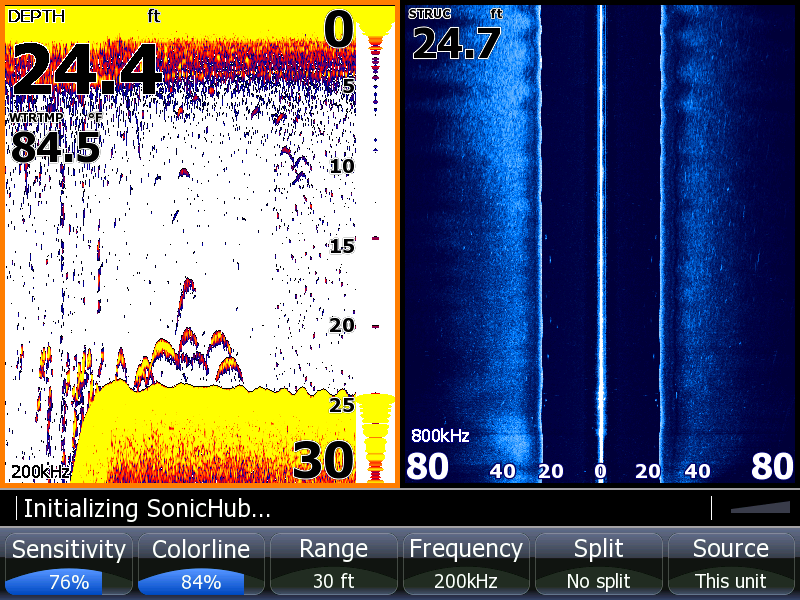 The school of Stripers at that speed show up as tiny dots bunched up very tight. 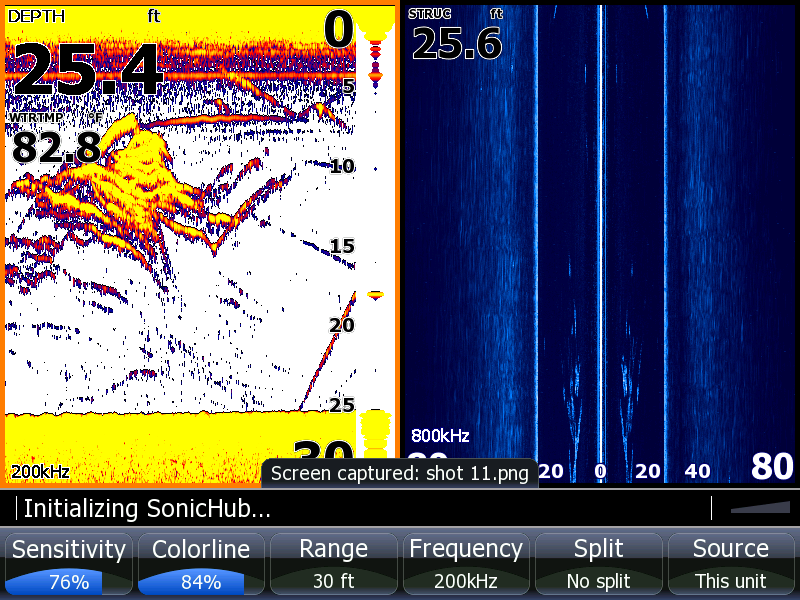 This is another shot of what it looks like to locate Stripers while running about 25mph. I was running that fast on the left of the screen. Notice as I can up onto the 25 foot flat fish were all over the break and up on the edge of the flat. As I slowed the boat the archers get larger but when I am running fast they are smaller and bunched up more due to the amount of water I was covering. 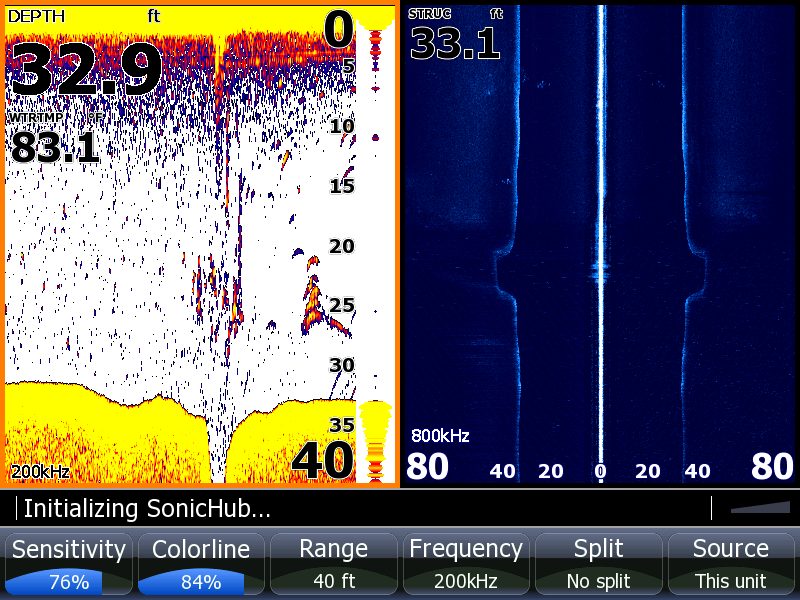 I simply turned the boat around, put the trolling motor in, put baits down at 22 feet and we rocked them. This is where we cought our largest fish of the morning along with a bunch of other keepers. Sunny and Hot, Water temperature climbing up to 85* and Clear. Today was a day of instruction. Floyd had been out with me before and wanted to get dialed in on reading his Lowrance, locating bait and schools of fish and setting up on and catching Stripers. When I got in his boat I had to completely change his settings on his unit just to read it at speeds over 5 mph. I didn't take long for him to see what he had been missing. By the end of the trip Floyd was convinced that he could go out and put Stripers in the boat. Today he went from 0 to a Hero in a couple hours and put more fish in the boat than they have all year. Floyd is a great listener and will do just fine out there on his own. He will be back out on his own on Thursday to prove it.